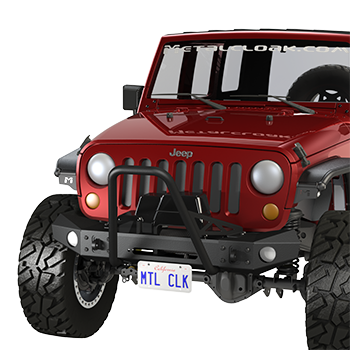 The MetalCloak License Plate Adapter is perfect for mounting your License Plate to the Frame-Built Bumper System. Mount the License Plate with the Quick Release Bolts Provided, or use Security Bolts if desired. This simple kit adapts to your Frame-Built Bumper and allows you to mount your front license plate using the existing holes on the bottom angle of your bumper. Note: This license plate bracket requires drilling of the Frame-Built Bumper for fitment of the Quick Release Riv-Nuts.